WWW.NOBODYWALKSNC.COMNOBODY WALKS 'TIL THE BOSSMAN TALKS! 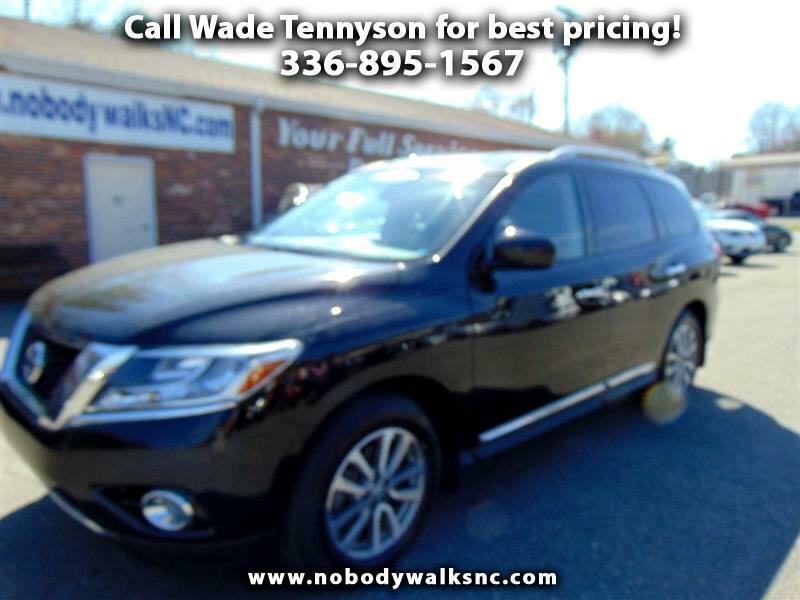 !CALL OR TEXT 336-786-7369 This 2014 Nissan Pathfinder SL features Engine: 3.5L V6, Transmission: Xtronic CVT (Continuously Variable), 5.577 Axle Ratio, GVWR: 5,986 lbs., Transmission w/Driver Selectable Mode, Front-wheel drive, 19.5 Gal. Fuel Tank, Single Stainless Steel Exhaust, 4-Wheel Disc Brakes w/4-Wheel ABS, Front And Rear Vented Discs, Brake Assist and Hill Hold Control, Wheels: 18" Alloy, Steel Spare Wheel, Compact Spare Tire Stored Underbody w/Crankdown, Chrome door handles, Chrome Bodyside Moldings and Black Bodyside Cladding, Body-Colored Power w/Tilt Down Heated Side Mirrors w/Manual Folding, Deep Tinted Glass, Speed Sensitive Variable Intermittent Wipers, Power Liftgate Rear Cargo Access, Tailgate/Rear Door Lock Included w/Power Door Locks, Roof Rack Rails Only, Fully Automatic Aero-Composite Halogen Headlamps, Front Fog Lamps, Radio: AM/FM/RDS/MP3/1CD Audio System w/6-Speakers -inc: XM Satellite Radio, USB/iPod connector (replaces standard auxiliary audio input jack) and speed sensitive volume, Integrated Roof Diversity Antenna, Bluetooth Wireless Phone Connectivity, 2 LCD Monitors In The Front, Heated Front & Rear Bucket Seats -inc: 7 passenger seating capacity, 8-way power driver's seat w/memory and power lumbar support, 4-way power AS seat, 2nd row 60/40 split w/manual slide/recline/fold flat and 3rd row 50/50 split w/manual recline/fold flat, Split-Bench Front Facing Heated Rear Seat, Manual Tilt/Telescoping Steering Column, Power Rear Windows and Fixed 3rd Row Windows, Fixed Bench Leatherette 3rd Row Seat Front and 2 Fixed Head Restraints, Compass, Remote Keyless Entry w/Integrated Key Transmitter, Illuminated Entry, Illuminated Ignition Switch and Panic Button, Proximity Key For Doors And Push Button Start, Remote Releases -Inc: Power Cargo Access, HomeLink Garage Door Transmitter, Cruise Control w/Steering Wheel Controls, Rear HVAC w/Separate Controls, Interior Trim -inc: Simulated Wood Instrument Panel Insert, Simulated Wood/Metal-Look Door Panel Insert, Simulated Wood Console Insert and Chrome/Metal-Look Interior Accents, Leather Door Trim Insert, Driver And Passenger Visor Vanity Mirrors w/Driver And Passenger Illumination, Driver And Passenger Auxiliary Mirror, Day-Night Auto-Dimming Rearview Mirror, Full Floor Console w/Covered Storage, Mini Overhead Console w/Storage and 4 12V DC Power Outlets, Memory Settings -inc: Driver Seat and Door Mirrors, FOB Controls -inc: Trunk/Hatch/Tailgate, Windows and Remote Engine Start, Driver / Passenger And Rear Door Bins, Delayed Accessory Power, Seats w/Leatherette Back Material, 4 12V DC Power Outlets, Electronic stability control (ESC), Side Impact Beams, Dual Stage Driver And Passenger Seat-Mounted Side Airbags, Tire Specific Low Tire Pressure Warning, Dual Stage Driver And Passenger Front Airbags, Curtain 1st, 2nd And 3rd Row Airbags, Airbag Occupancy Sensor RADIO: BOSE PREMIUM AM/FM/CD AUDIO SYSTEM, RADIO: PREMIUM AM/FM/CD AUDIO SYSTEM W/NAVIGATION H and H Auto Sales has brought quality Certified pre-owned cars,trucks,vans and SUVs to the people of Surry County,Mount Airy, Elkin, Winston Salem, Hillsville ,and Galax. Customers are our #1 priority from the sales staff,finance department,service and clean-up department,when it comes to selling a vehicle.The majority of our vehicles are off lease,program cars or local trade-ins! !Hand picked from our owner of 40 year experience!! Call or Text 336-786-7369 H & H AUTO SALES .. www.nobodywalksnc.com This is a Gold checked CERTIFIED vehicle, and could be eligible for up to a 5 year /100k mile factory extended warranty !! We also give a FREE 30 day or 2000 mile POWERTRAIN WARRANTY on most of our vehicles !! **Your FULL SERVICE DEALER**FREE COMPLETE CARFAX !! We are Proud Member's of the Better Business Bureau (BBB) & National Independent Automotive Dealer Association (NIADA) !! Please contact us at : sales@handhauto.com or call /text 336-786-7369 for more details and photos!!! We are more than willing to meet our customers off-site within reason for a test drive. Thanks for looking!! A **Disclaimer: All vehicles are listed with equipment and pricing to the best of our knowledge, Some information could be unintentionally missing or inaccurate. We (H & H Auto Sales) will not be responsible for any discrepancies.WHERE NOBODY WALKS 'TIL THE BOSSMAN TALKS! !